Layered monoprints are colorful and fun! With a gel printing plate, inks, paints, stencils, masks and found objects, you will learn how to create beautiful layered monoprints on paper for journal covers, art journal pages, note cards, scrapbooking pages or anything else you’d like to make. The fun is just about to begin! Until I delved into mixed media, I’d never heard of monoprinting. Honestly, at first blush the term monoprint was a bit intimidating. When I learned that monoprinting is a form of printmaking where the print is produced only one time rather than through traditional printmaking methods like lithography, woodcuts or etching, I was certain that I would leave monoprinting to the experts! It sounded too complex and scary for a novice like me. One day a I decided that I would no longer worry about “doing it right.” I never knew what “it” was, but I was pretty sure that I’d never done “it” right in my life! Once I stopped self-judgment, I began playing and enjoying the act of creating just for the sake of seeing what might happen. That’s when words like monoprinting no longer felt quite as overwhelming. I felt safe to explore new ideas and techniques and I might make mistakes but so what? As I embraced creative possibilities, I didn’t make mistakes. I simply created results. 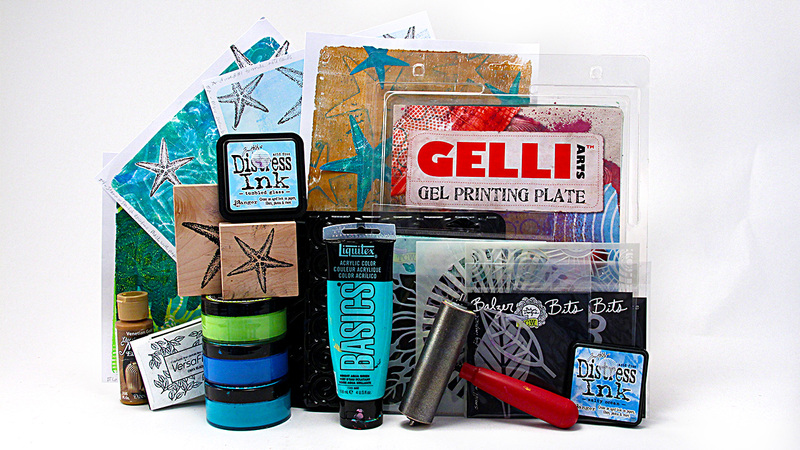 When I saw the very first preview about the Gelli Arts Gel Printing Plate, I paid little attention; but I never forgot about that magic odd gelatin-like thing. As I embraced mixed-media, the lure of a gel printing plate got the best of me. I had to own one even though I had no idea what to do with it. After watching dozens of people using a Gelli Plate, I knew that I had to find a way to create my own kind of magic with it. I got brave and did exactly that. Hundreds of prints later I realized that I’d begun to understand how the plate actually worked. If you’re as confused as I was about how to use the printing plate, perhaps you’d like to save yourself a few hundred sheets of paper and card stock and learn how to achieve results that you like as soon as you gather your supplies and open your plate. Because there is so much to learn, this introductory class will be split into two parts. You’ll learn about the best types of ink to use with your plate and how to use paints, stencils, masks and much more.